As this week is National Eating Disorders Awareness Week, I thought it would be pertinent to talk about a certain little lady who has played a large role in shaping America’s youth: Barbie. Yes, Barbie. 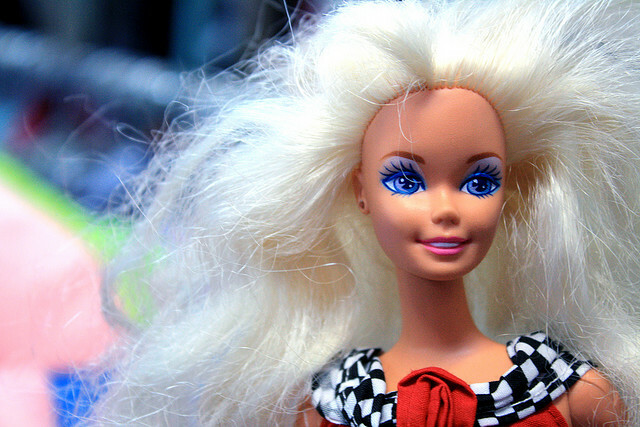 Pictured above is “Totally Hair Barbie”– a doll I remember very distinctly from my childhood. My sister and I used to spend hours playing with our Barbies. They all had unique names, personalities and plot lines– many an afternoon was spend building them houses and acting out their intricate relationships. To my sister and to me, Barbie was nothing more than a toy. I cannot remember ever thinking that I wanted to look like Barbie. Okay, so I wanted my Princess Jasmine Barbie’s hair, but that’s about it. For many other girls, however, it seems as though Barbie defined what they considered to be an ideal body shape: a large chest, tiny waist and legs for days. It is likely that having this impossible ideal has influenced girls to diet and may have even pushed some into eating disorders. The South Shore Eating Disorder Collaborative (SSEDC) outside of Boston, MA has created a “Get Real Barbie” Fact Sheet in order to increase awareness of this unrealistic portrayal of women, and to start discussion about how the pressure to diet at a young age can lead to eating disorders. A girl usually has her first Barbie by age 3, and collects a total of seven dolls during her childhood. In my opinion, this last point is by far the most disturbing–Barbie was meant to be a role model for girls showing them that they had the potential to be anything that they wanted. If Barbie was a doctor or an astronaut, then you could be too! Although I wasn’t one of them, I’m sure that some girls wanted to be just like Barbie. If Barbie thought the best way to be the perfect weight (110lbs at 5’9″) was to be on a diet, then I’m sure some girls thought so too. If Barbie thought that the best way to diet was simply to not eat, then I’m sure some girls did too. According to the “Get Real Barbie” Fact Sheet, there are two Barbies sold every second worldwide. With that kind of proliferation, how many girls do you think have been affected by Barbie’s unreal proportions? What’s your stance on the Barbie Issue? * Source: Body Wars, Margo Maine, Ph.D., Gurze Books, 2000. Stop Setting Weight Loss Goals. I promise your life will be easier. I have two daughters who are 5 and 2. We have – and will always have – a strictly Barbie-free home. Really, even if they never develop any issues from playing with them, *I* don’t want to stare at that body! At 5’2″ and after having three babies, my own body issues are bad enough! Plus my son (who’s almost 4) doesn’t need to get any ideas that that’s the way a woman “should” look. I want him to be raised knowing that every woman is uniquely beautiful, regardless of height, weight or any other physical trait. That’s great, Jaclyn! I never thought about Barbie from a little boy’s perspective– thanks for sharing this.